KD Pharma Exhibition by Idea International, Inc.
With more than 20,000 clinical studies showing positive health benefits from Omega-3 EPA & DHA, KD Pharma is increasing its visibility at exhibitions such as Health Ingredients Japan, an important exhibition for every manufacturer, company or brand involved in the health ingredients industry. This attractive 3m x 6m design played off the company’s logo and corporate colors, with informal seating and storage worked economically into the architecture. 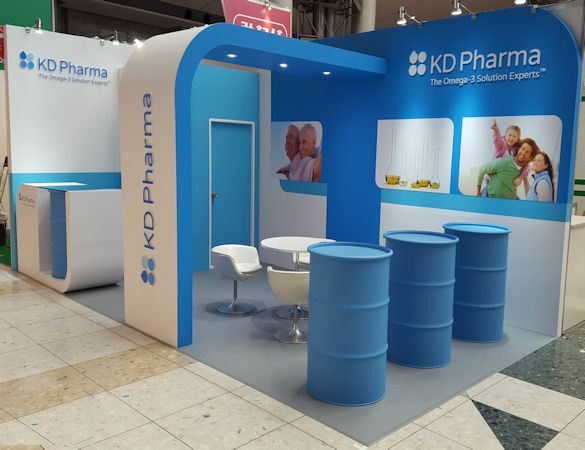 The company launched KD-Kap at Health Ingredients Japan, a new line of water miscible micro-encapsulated Omega-3s, as part of an aggressive roll-out and positioning in an increasingly competitive market.